Ex-UK border force head Brodie Clark says he is "surprised" ministers were unaware biometric fingerprint passport checks had been relaxed at Heathrow. Mr Clark was suspended after claims he eased passport checks at UK borders beyond what Home Secretary Theresa May had agreed to in a trial. She has now been sent further questions by the Commons Home Affairs Committee, having previously appeared before it. Mr Clark has told MPs he did not ignore government policy. He told BBC Radio 4's Today programme that, with hindsight, he should have checked "more thoroughly" what Mrs May knew. Addressing MPs on the Commons Home Affairs Committee, Mr Clark said he was "no rogue officer". MPs on the committee also questioned UK Border Agency chief executive Rob Whiteman, who said Mr Clark dropped fingerprint checks without telling ministers, even though they had rejected such a move as part of the pilot. 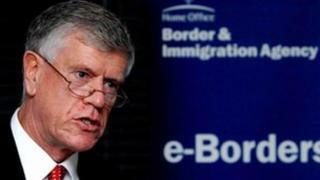 Mr Clark stepped down after the relaxation of border checks was revealed, saying his position had been made "untenable". The committee's chairman, Keith Vaz, said it "remains concerned by the contradictory information that it has received so far. "The integrity of our borders is of the upmost importance. We are determined to find out the facts surrounding the events at the UK Border Agency this summer and have written to the home secretary with further questions." The committee has also asked the home secretary to supply copies of six documents. Meanwhile, it has has asked Immigration Minister Damian Green and Home Office Permanent Secretary Dame Helen Ghosh to give evidence in person on 22 November. Speaking to the Today programme, in his first interview since the scandal erupted, Mr Clark said he found out earlier this year that staff at Heathrow had not always carried out fingerprint checks when it was very busy. Mr Clark said he thought that was a sensible practice - and he did not inform ministers. He told the programme he expected ministers would have been aware that guidelines drawn up in 2007 allowed the relaxation of some checks for health and safety reasons when queues were becoming dangerously long. "I'm surprised they didn't know that it was happening," he said. Crucially, the 2007 guidance does not permit the relaxation of fingerprint checks - it only allows border staff to forgo checks on passengers from the European Economic Area against the warnings index of terrorists and criminals when queues become dangerously long. The former border chief admitted that he had "no evidence" that ministers knew fingerprint checks had been relaxed. "Perhaps I should have more thoroughly checked what the home secretary knew or did not know," he said. But he added: "I didn't think for a minute they would object under those circumstances." Rob Whiteman told MPs on Tuesday he believed the 2007 guidelines had been "stretched" and checks were being relaxed more often than could really be justified by health and safety concerns. Mr Clark said he had raised this possibility earlier this year with Heathrow's head of security, but said: "I am satisfied that he has a very responsible approach to the use of that policy." Mrs May said she had not permitted scaling back fingerprint checks. But Mr Clark told the BBC such issues would have formed part of briefings to Mrs May when she came to office. He said the immigration minister, Damian Green, and the former security minister, Dame Pauline Neville-Jones, would also have been told about "practices and activities" at the border during "critical" times. Media captionBrodie Clark: "Perhaps I should have more thoroughly checked out what the home secretary knew or didn't know"
The BBC's political editor Nick Robinson said Mrs May would be feeling stronger now than 24 hours ago given Mr Clark's acknowledgment that he should have checked more thoroughly with her. He said he had spoken to one former Labour minister, in office at the time the 2007 guidelines were drawn up, who also could not recall being briefed about the possibility that some checks could be suspended in certain circumstances. Mrs May has said she authorised the relaxation of some checks on children from the EEA and some extra checks on EEA adults under "limited circumstances" at peak times - but claims Mr Clark allowed officials to go further, without ministerial approval. Mrs May has announced three inquiries into what happened, the main one led by the Chief Inspector of the UK Border Agency, John Vine. Mr Clark is suing for constructive dismissal, accusing Mrs May of destroying his reputation by alleging that he eased border controls without her permission.